DAS-based block storage is fixed by nature, making it difficult for data centers to accommodate highly dynamic workloads and capacity demands. 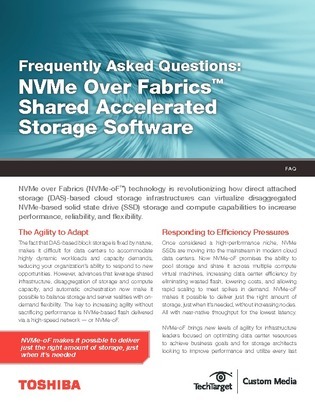 Though the following statement may surprise you, one method of increasing agility without sacrificing performance is NVMe-based flash delivered via a high-speed network, or NVMe-oF, which can pool storage and share it across multiple compute virtual machines. Why is it important to adopt NVMe-oF in my cloud data center? What are the key software elements within the NVMe-oF software stack? What are the open source options available for shared accelerated storage software?